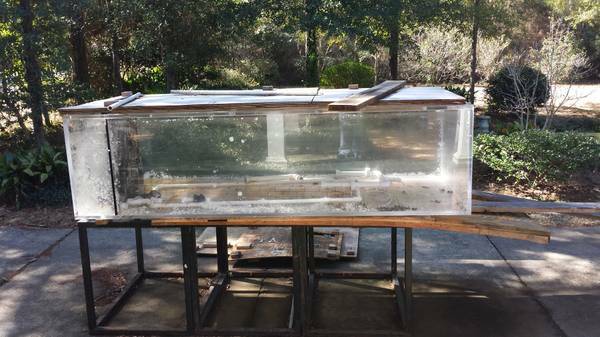 I have up for sale a very large aquarium. It is made of very thick acrylic. The tank measures 10 feet long, 4 feet wide and 33 inches tall. when placed on the stand the tank is just over 6 feet tall. The stand is made of square tube steel and built in 4 sections. 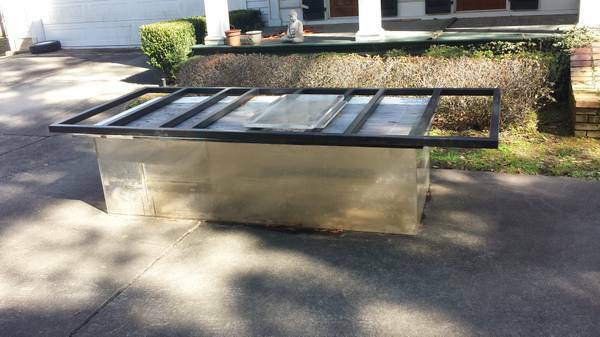 The sump tank fits perfectly under the stand and holds around 200 gallons of water(NOTE! sounds like a leaker, careful on this one…Trifisher). originally planned to put this inside my business but won’t have the room we thought we would. email with questions or for more pictures. can show by appointment. I just pulled it out of storage and took it to my shop when we found out it wouldn’t fit. I’d rather not pay to store it again. great for fish store or restaurant or anyone who wants a piece if the ocean in their life. 3500 obo I have a hydraulic lift we can use to load onto your truck or trailer. I can help unload and setup for a fee. I’ve been in hydroponic and aquarium consulting for years so I’m very aware of how to properly setup systems.